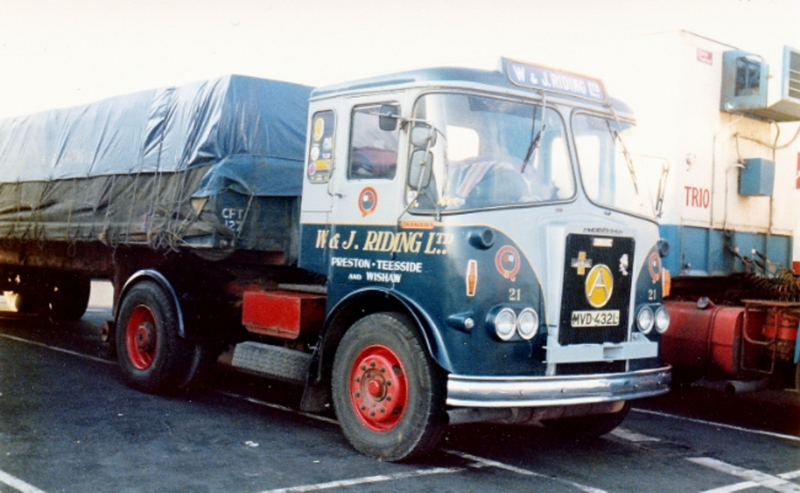 Atkinson Borderer 4X2 tractor unit Reg No MVD 432L has had quite an eventful life and now over forty years old is still on the road today. 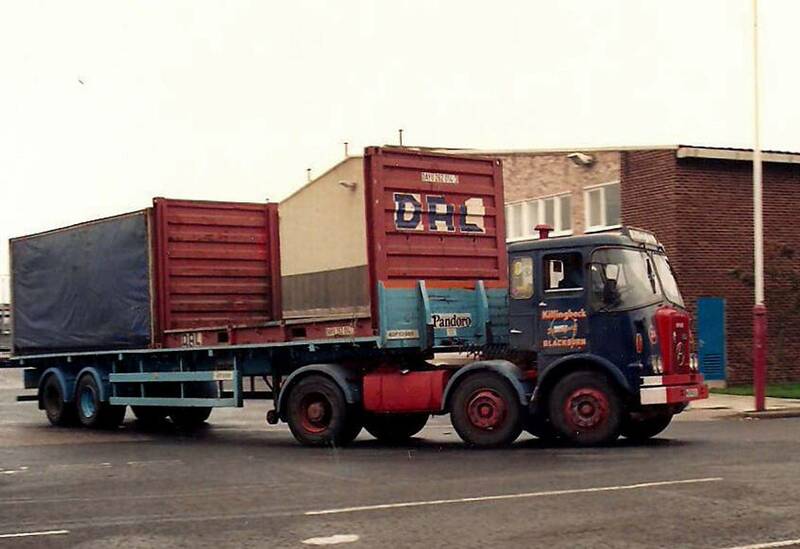 Originally registered new to a member of the Transport Development Group Ltd 'Monkland Motors of Airdrie' on the 1st of May 1973 it was in March 1975 that Tom Riding travelled up to Scotland and bought all ten Atkinson Borderer's that they had been operating after TDG Ltd decided to close the company down. 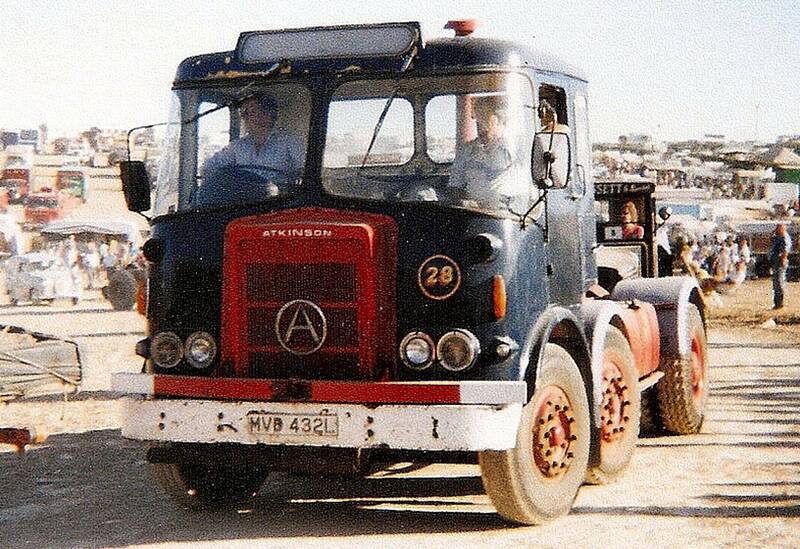 One of these ten Atkinsons was Atkinson Borderer 4X2 tractor unit Reg No MVD 432L which became Fleet No 21 'Couragous' in the Riding fleet. 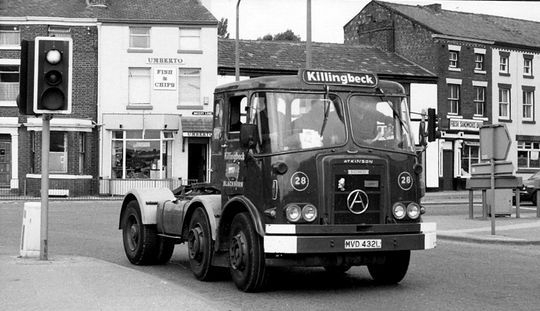 Powered by a Cummins 220 engine in line with a Fuller 610 gearbox and group axle it remained in the Riding fleet for nine years until it was sold on to John Killingbeck of Blackburn in 1984 were Dr John worked his magic transforming it into a 6x2 tractor unit. Atkinson Borderer 4X2 tractor unit Reg No MVD 432L Fleet No 21 'Couragous' is pictured here after joining the familiar W & J Riding livery and joining the fleet in 1975. 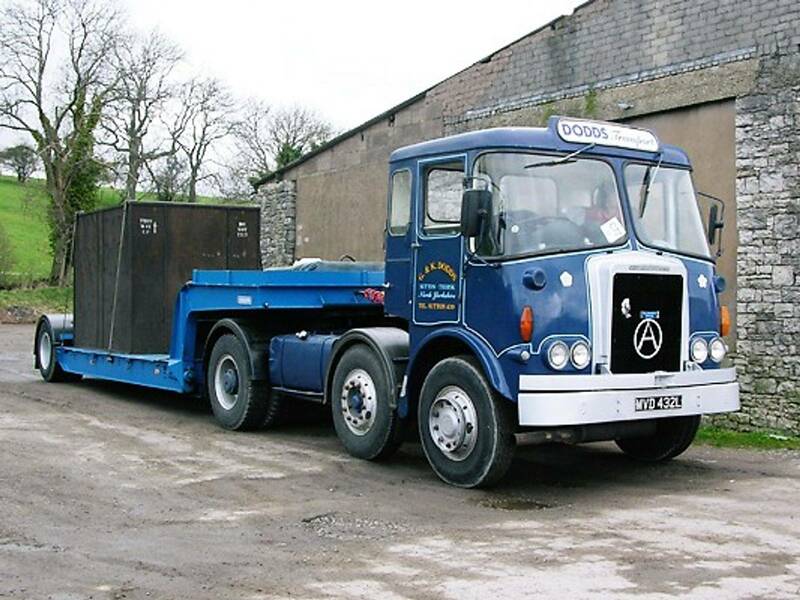 Atkinson Borderer 4X2 tractor unit Reg No MVD 432L Fleet No 21 'Couragous' is pictured here in the yard at Longridge shortly before it was sold on in November 1980 to Tom Riding's brother in law L J Ball of Dutton for £1,600 plus vat. Before leaving Riding's it was repainted in L.J. Ball's yellow and grey livery at a cost of £250 in Riding's own paint shop. After being in service with L J Ball for four years it was then sold to John Killingbeck of Blackburn in 1984. After five years in the Riding fleet and four years with L.J. 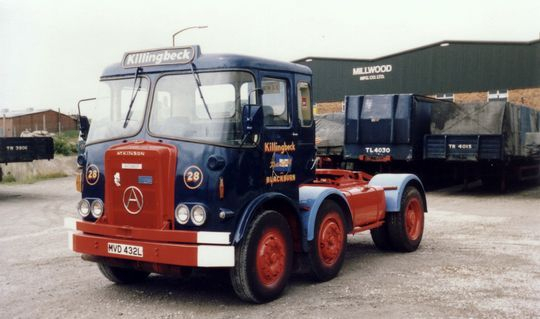 Ball MVD 432L was sold on to John Killingbeck of Blackburn in 1984 were Dr John worked his magic transforming it into this 6x2 tractor unit. Seen here just after being rebuilt he had also replaced the Cummins engine with an uprated Gardner 180 which enabled him to get it plated at 32 tons. 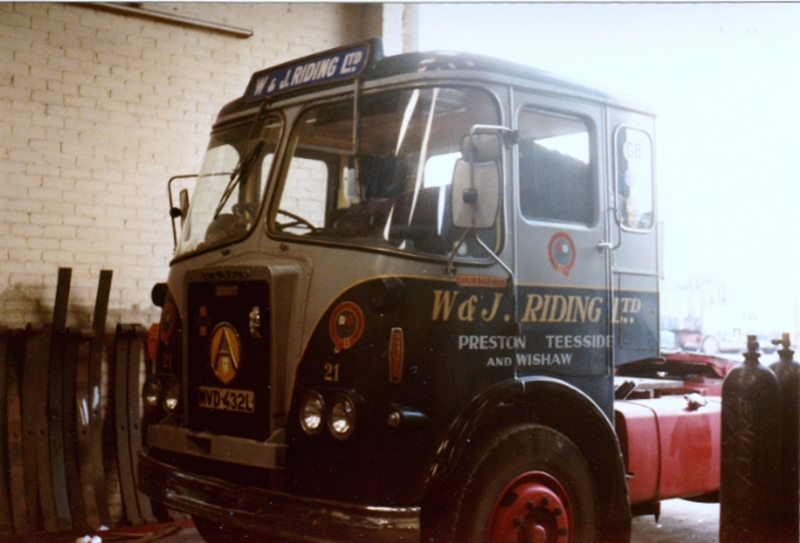 After the rebuild the former Atkinson Borderer 4x2 was called an 'Atkinson Buccaneer', the name being chosen by life long Atkinson fan the late Michael Deuchars of Edinburgh who sadly passed away on the 17th of July 2013. 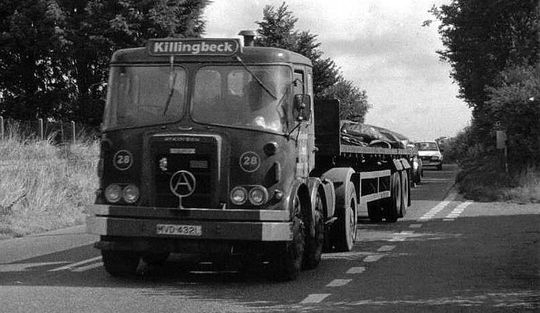 Upon entering service with John Killingbeck the now named 'Atkinson Buccaneer' was assigned fleet No 28 and was soon put to work carrying a variety of loads on general haulage. Here we see it fully loaded with wooden snow break fencing destined for Scotland. 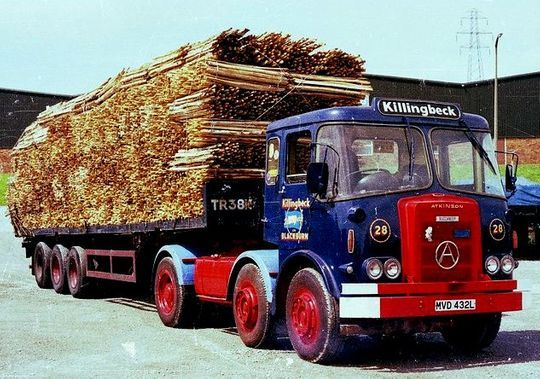 Seen here parked in John Killingbeck's depot at Blackburn Atkinson Buccaneer Reg No MVD 432L is coupled to a tri- axle flat trailer with a neatly sheeted and roped load on board. Pictured here leaving Fleetwood Docks on the 10th of October 1987, three years after being in the John Killingbeck fleet, MVD 432L is seen hauling one of Pandoro's 40 foot tandem axle flat trailers loaded with two 20 foot ISO containers on board. A unit only shot of John Killingbeck's MVD 432L as it negotiates the turning off the A583 Watery Lane onto the A5072 West Strand in Preston. Another nice on the road shot of John Killingbeck's 'Atkinson Buccaneer' Reg No MVD 432L. 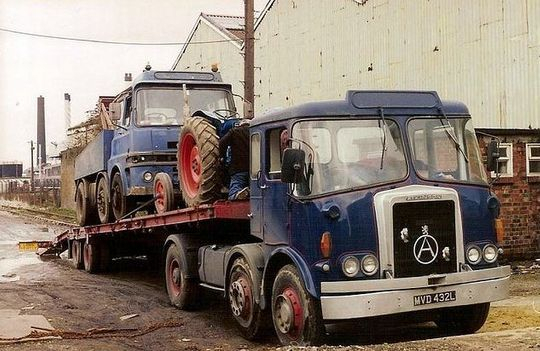 Not long after this particular photograph was taken the vehicle was sold on to a Mr Ted Hannon. 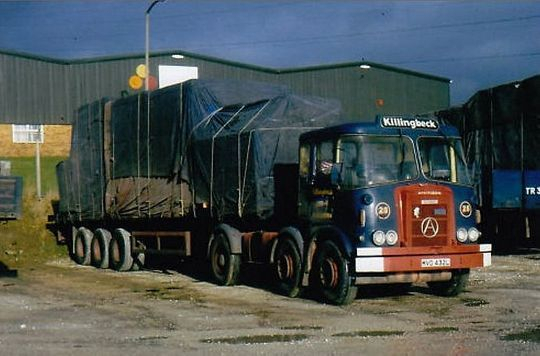 Atkinson Buccaneer Reg No MVD 432L is pictured here not long after being withdrawn from John Killingbeck's fleet. 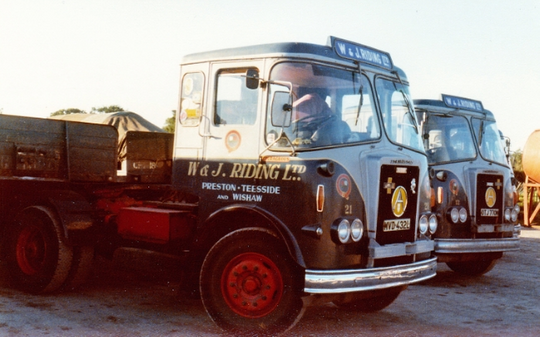 John sold the 'tuned' Gardner 180 6LXB engine on to Walsh and Deardon of Blackburn for £1,200 after which time he sold an engine-less MVD 432L to a Mr Ted Hannon who later fitted it with a Gardner 150. Atkinson Buccaneer Reg No MVD 432L is seen here at Hayes West London in 1995 after undergoing some restoration. The familiar red radiator grille and white bumper has, by this time, been repainted in silver. Atkinson Buccaneer Reg No MVD 432L is seen here in it's present form. Owned by Geoff Dodds of Thirsk and now over 40 years old it can be seen at various vehicle rallies throughout the summer.